Sasaki Time: Chinese Orange Donut Holes Recipe! 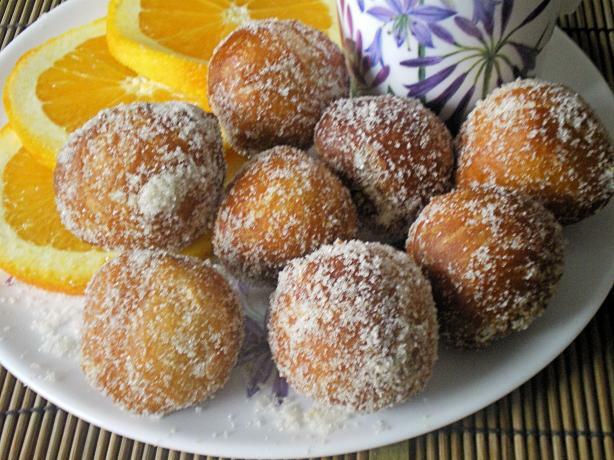 Chinese Orange Donut Holes Recipe! 1 Place zest, sugar and cinnamon in a paper bag and shake to combine. 2 Place oil in a deep pan until it comes about halfway up the side of the pan. Heat oil to 350 degrees Fahrenheit. 3 Slice biscuit dough in quarters and roll into balls to form 24 donut holes. 4 Working in batches, place donut holes in hot oil and fry until golden, about 6 to 8 minutes. 5 Transfer hot donuts to the paper bag and shake to coat with orange sugar. Serve immediately.